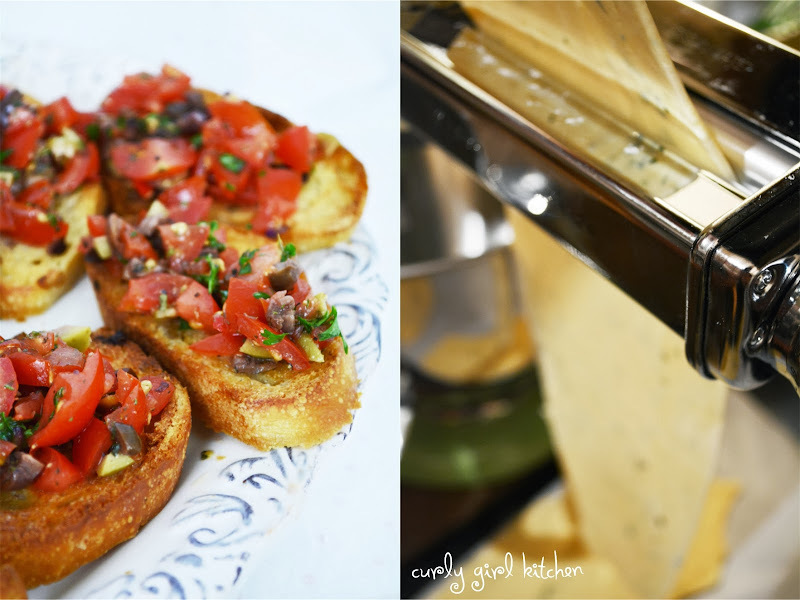 Did anyone else get a pasta roller/cutter for Christmas? I'm excited to say that Jamie got me the pasta attachment for my mixer, and we've been enjoying making a few batches of fresh pasta lately. 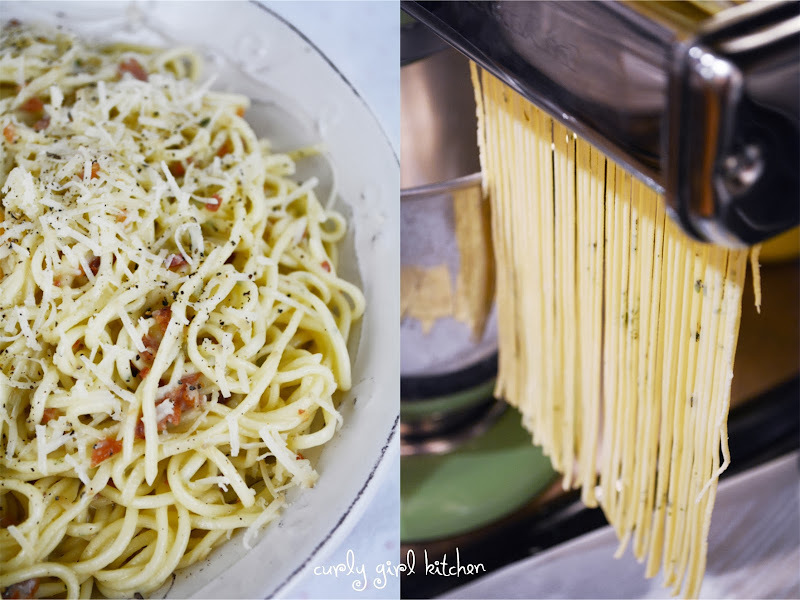 For our first pasta making adventure, I knew it would have to be spaghetti carbonara, which, in my opinion is one of the most fantastic of all pasta dishes. 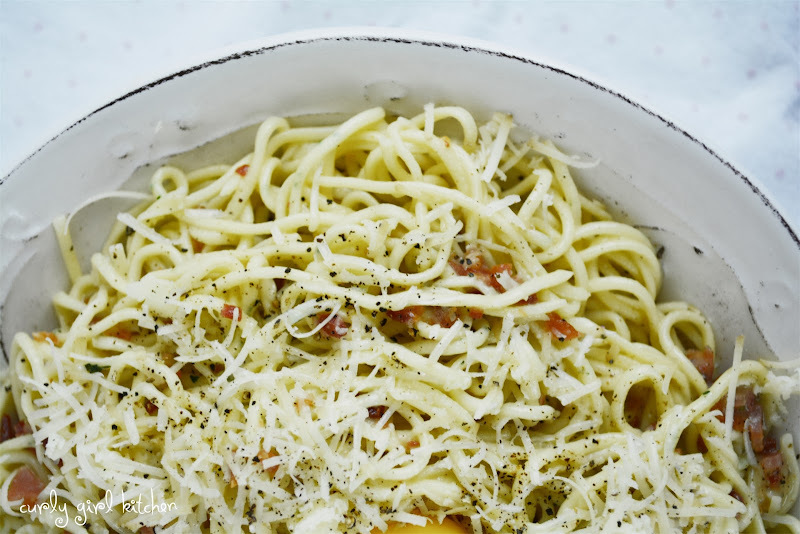 It also happens to be one of the simplest to make, with an egg yolk, a little olive oil and freshly grated Parmesan cheese forming a creamy sauce that coats the pasta with the help of some of the cooking liquid, lots of freshly cracked black pepper, and crispy, salty crumbles of bacon or prosciutto. I made a basic egg pasta dough with bits of fresh thyme, which added beautiful splashes of green color as well as beautiful flavor. 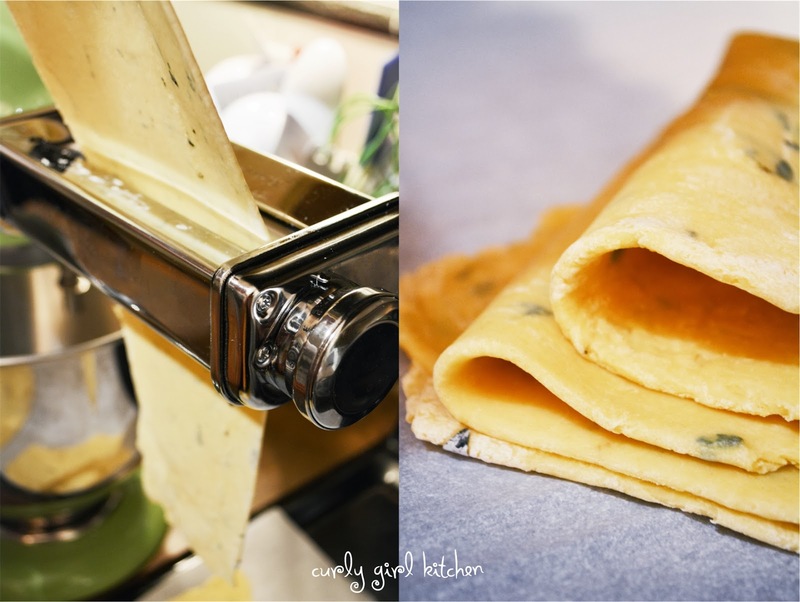 Working with the pasta dough was completely different from pie dough, shortbread dough, or bread dough, all of which I'm much more familiar with. But I trusted that it would taste good, and I have to say, after tasting the fresh pasta, there's really no comparison to dried and store-bought. Not to mention, penny for penny, the homemade dough is much cheaper as well, since flour and eggs are about as inexpensive an ingredient as there is. 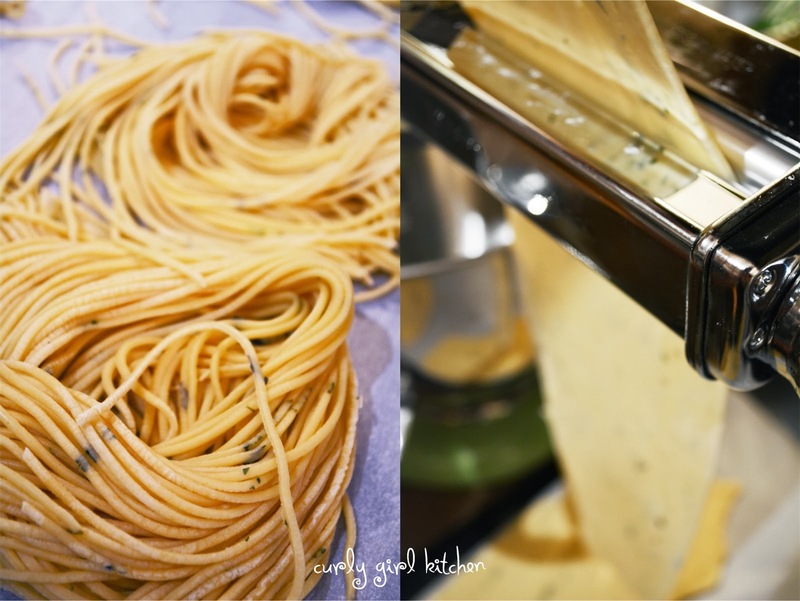 After a successful pasta-making experience, I'm looking forward to trying more adventurous recipes. 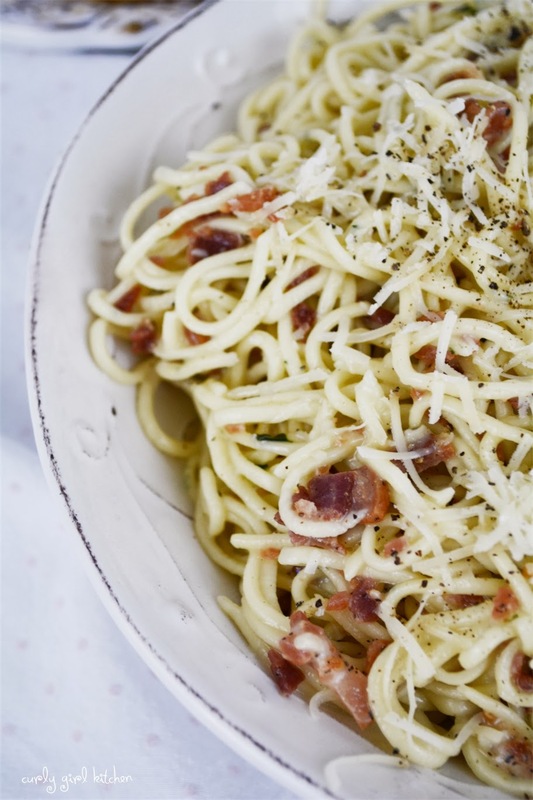 But as simple as spaghetti carbonara is, the leftovers make a fantastic late night snack. And seeing as how it was well after dark when we made this (I'm so over these 4:30 pm sunsets), and most of the photos were taken standing next to my mixer, please forgive the badly-lit photos in our kitchen. Combine the flour, salt and herbs on a clean workspace. Make a well in the center; add the oil and eggs, and stir with a fork to start incorporating the dry ingredients into the eggs. Add water, a tablespoon at a time, kneading the dough with your hands for 4-5 minutes, until it sticks together and becomes leathery and firm, but pliable. Wrap in plastic wrap and let rest on the counter for 20 minutes. 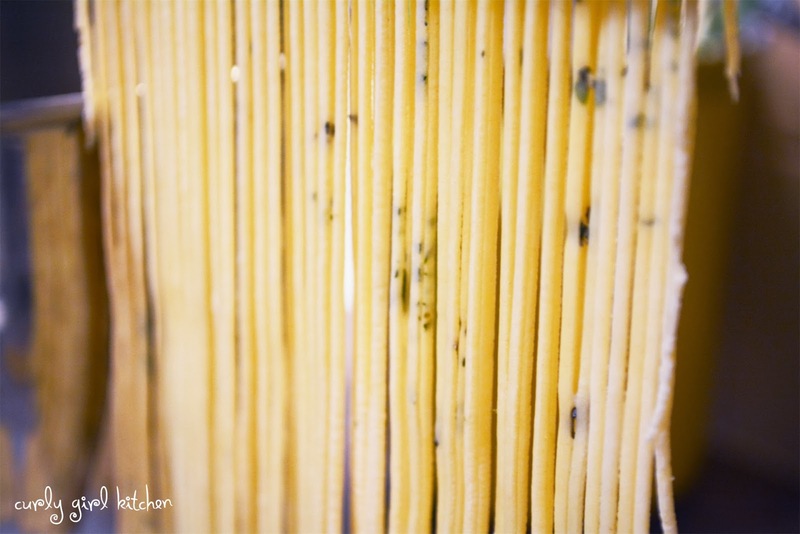 Cook the pasta in salted water until al dente, and transfer to a large bowl, reserving the cooking water. Add the beaten egg yolk, olive oil and about 1/4 cup cooking water to the pasta, and toss to combine. Add the cheese, and a little more water as needed, continuing to toss until a creamy sauce forms and coats the pasta. Add the bacon or prosciutto and lots of cracked black pepper. Taste and add salt, if needed, but remember that the cheese and bacon will add salty flavor as well. Garnish with more cheese, and even another cracked egg yolk on each serving, if you like.